It was a beautiful day driving here to Charleston today. Sun shining down on us and clear skies…easy sailing. Baby girl has been sick for several days and today she was really happy and perky and feeling so much better. That was exactly what my soul needed. I was so worried about her. 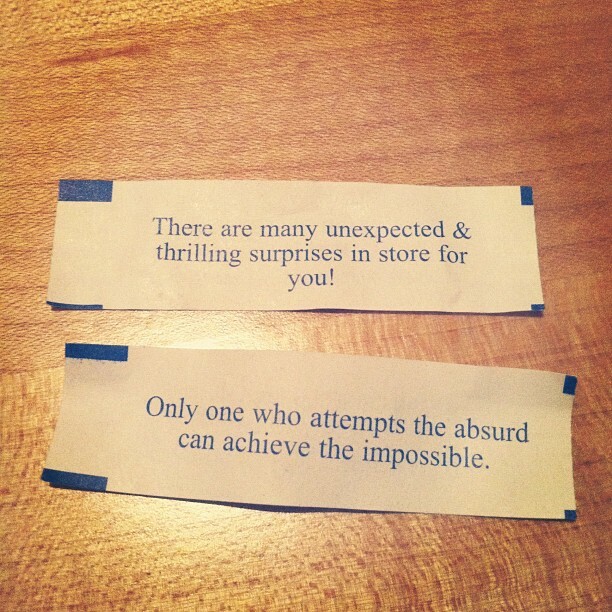 My mom and I went out to dinner tonight and these were my two fortunes. I thought they were pretty awesome. I think the hardest part about this whole experience is that it is a bit of a surprise…I don’t know exactly what to expect on Wednesday. I don’t know what it feels like to be in a hospital not giving birth. I haven’t ever been intubated. I haven’t ever had surgery (minus removing a couple wisdom teeth..hah). I certainly haven’t ever spent 5 days in a hospital. I’m definitely unsure of how my body will react to all the drugs. How quickly will I recover? Will it hurt lots? some? beyond belief? less than I could imagine? I don’t feel anxious but I feel calm, serene…I am peaceful but quiet. I did get a call from the breast surgeon’s office today and they decided that based on my MRI from last week that they would like to do a sentinel lymph node biopsy on my left side during surgery on Wednesday. Just another little bump in the road but another thing that will give us more information and help me have a healthier future.